I was lucky enough to meet John Pyles many years ago through Mike DeVries. We were both clients of Mike's and both had caught the tattoo bug by this point, filling up our skin with portraits and other projects, and sharing each addition with each other along the way. Not only does John have primo taste when it comes to tattoo artistry choices, but he is also an intelligent guy who is extremely generous and kind to everyone he meets. An art enthusiast himself, John is well-versed in tattoo techniques and loves talking ink at tattoo conventions. He travels far-and-wide to support the industry and keep up with what is happening within the ink world. Tattoos aren't the only love of his life though, just ask his beautiful wife Johanna, of whom he has dedicated a sleeve of his body to. She is a gorgeous woman who radiates in the ink interpretations that John has appropriated in her honor. He also wears portraits of his two children, as well as an amazing collection of movie-themed pieces, an oceanic scene and so much more. It was fun to get a synopsis of all that John has been up to lately, both in relation to his tattoo projects, his family, and other exciting forthcoming projects he has in the works. I hope you enjoy reading all about John Pyles and sneaking a peek at parts of his incredible ink collection. I started a little late; I was 33 years old when I got my first tattoo. Two main things intrigued me about getting that first tattoo. I used to be an art major in school and loved the medium; and I grew up in the San Fernando Valley, heavily involved in the pro-skateboard scene in the 80s, so I had lots of friends that had them. I had always wanted to get them but just never devoted the time or money to do so. A friend and I just said it was time to do it rather than just talk about. So of course we went to Hollywood. I’m currently a business consultant in the development industry. I help government and private companies plan and build large-scale community utility systems. It is part engineering and part business planning. Sure, brief may be tough, but I’ll try to keep it short. My front panel (chest, both ribs, stomach, collar bone) is all about family and faith. Mikey Montoya and his brother, Tommy Montoya, did images of each family member. There are some iconic images of Jesus (by Mikey) and Mary (done by Mike Devries), as well as a killer piece by Mike DeVries of my hands held to the heavens. Lastly, I have some awesome script that says “Love Honor Cherish” with three roses done by Tim McEvoy, a super talented and incredibly versatile artist at Art Junkies. My right leg has an exceptional custom piece by Kari Barba, one of the true female pioneers in the tattoo industry. It’s an ocean scene that started as a cover-up (remember that first tattoo? Yep, gone - ha ha) and ended up as a full quarter leg sleeve. It’s still a work in progress but one of my favorites nonetheless. My left leg sleeve, which was just recently finished, was done primarily by Mike DeVries, with the lone exception being a Frank Frazetta reproduction, by artist Stephan Chaudesaigues from France. The other pieces on this leg are just an amazing collection Mike and I have been working on for the last five or so years. 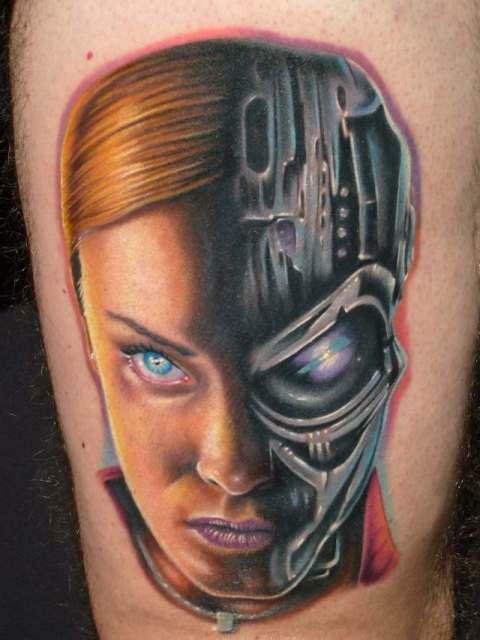 The inside of my leg is all images from the Terminator movie characters, and the outside is all characters from the movie Chronicles of Narnia, based on the book series by C.S. Lewis (an incredible writer). Then there are my arms, which I have also devoted to family. My left arm is devoted to my two children. I have two pictures of each child, one as an infant, and one as a young adult (they’re 23 and 25, respectively). 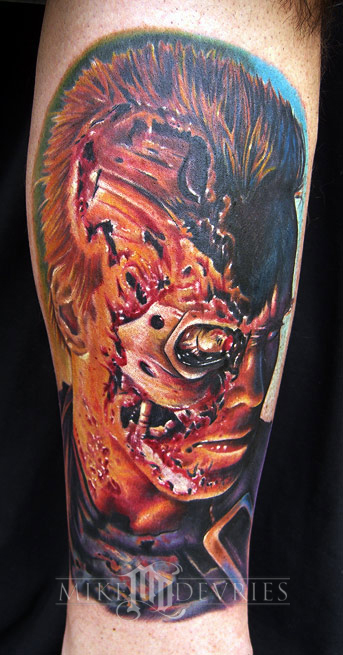 The artwork was done by Mike DeMasi at Art Junkies, one of the best all-around tattoo artists in the industry. He has quietly and unassumingly mentored and advanced so many, that you’d be surprised how many big-named, talented artists count him among their biggest influences. Then there is my right arm, which is entirely devoted to my extraordinary, incredible, loving, (insert an endless string of superlatives here) wife. I thought I’d play out a cliché - “I’d give my right arm for that woman.“ Truth is, I’d give up much more than that. Anyway, three portraits, an image of her hand holding my heart, and several flowers later, I have what I consider to be one of the most visually stunning pieces in my collection. The artist is none other than Mike DeVries, which I believe was one of your earlier Inkerviews. The man and his work is by far my favorite, and speaks for itself. Just amazing (he’s done 75% of my collection)! The portraits of your family members are stunning! Can you explain what those mean to you? 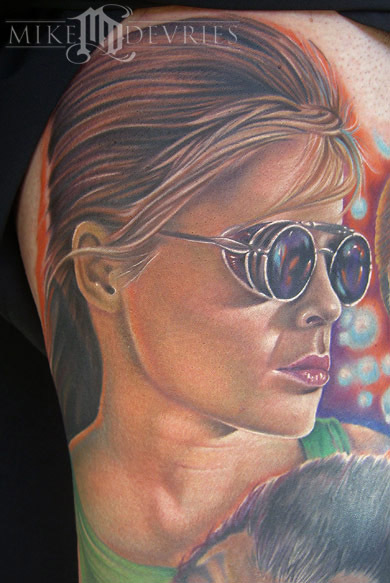 What do those whose faces you wear think about being permanently inked on your skin? The best way I can explain it is that the “family and faith” imagery I adorned myself with, truly reflects who I am, and what I am devoted to most. The amount of love I have for them is immeasurable and I hope my devotion is evident enough, through both action and imagery, to influence other men to make the same type of other-centered commitment to their families. My family loves the imagery of themselves displayed on me. Fortunately, the artists I chose to do the work did a great job. As you could image, women (my wife and daughter) are sensitive about how they look, and Mike, Mike, Mikey, and Tommy really nailed it. You are quickly running out of room (skin-wise). Do you find yourself becoming more discerning nowadays before starting a new piece? No doubt about it, I’m definitely more discerning than when I got that first tattoo. In the beginning, it was about the piece, now it’s about the project. Thinking big, rather than small. But one advantage to getting a bodysuit later, rather than earlier, is that I know who I am and what I want. I’m patient in the selection process, research extensively, and discuss with the artist before making a final decision. I strive to pick images and projects that excite both the artist and I. What are some projects that you have planned for the future, and with which artists will those be with? Well I have work in progress with Mike DeMasi and Kari Barba that I’d like to complete soon. 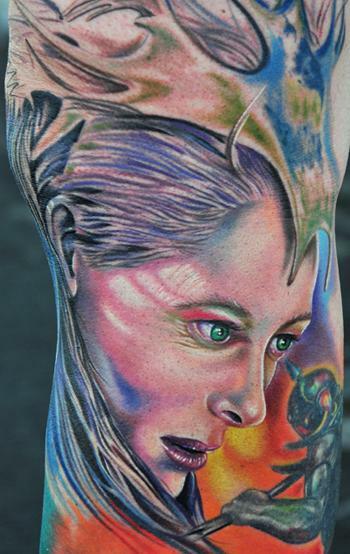 But as far as new projects, I’m going to have Mike DeVries do an entire back piece (which is currently vacant) on me. We’ve discussed several things over the past five years, but we’re going to do a huge piece based on one of the old masters from the renaissance period, Peter Paul Rubens. What are your feelings about the tattoo industry nowadays and where do you see it heading next? While there’s always a presence of artists within the community, more recently there’s been a tremendous influx of new artists (trained and untrained) joining the tattoo industry over the last ten years or so. This, coupled with its more recent growth in popularity, has afforded the artists the opportunity to explore entirely new methods. The talents of old versus the talents of new have resulted in creative tensions in this small microcosm of a larger art community. These tensions are leading to all types of collaborative creation, exciting creation, that hopefully continues to influence and inspire current and future generations of artists. I’m not sure I know where it will lead, but when tattoo artists are considering their ink as just a part of the artistic repertoire and they’re engaging regularly in painting, sculpting, photography and a bunch of other mediums, now that’s exciting! I love that the artistic talents in this industry are getting the attention it desires. Can you tell us about your new project with Mike DeVries, Reflected Art? Well, as you would imagine, after five years or so of getting tattooed by Mike, we’ve got to know one another pretty well. We both share a passion for art and have often talked about the latest project(s) we were working on. That led to discussions about doing something that could help further promote and expose the exceptional artistic talent that exists within the tattoo industry. A number of artists have published works, including books, DVDs, prints, etc. We plan to promote these artistic masterpieces, which help others reflect on what they might be able to achieve through their own creativity. The longer term vision behind Reflected Art is to share these products with a much larger art community that exists both inside and outside of the our industry. Our website is currently under development and we are planning a launch for earlier 2010. You will be seeing us at conventions around the country, at art shows, and we’re planning to sponsor some really exciting art projects in the near future. Well, I not very good at this type of thing but here you go: grateful. Johanna…or cheesecake if she’s not in the mood.